Under Florida law, prenuptial agreements (commonly referred to simply as “prenups”) function as a legal tool that can help engaged couples protect their financial futures by securing their assets in the event of a divorce. However, only valid prenups are enforceable. Therefore, in order to successfully fight a prenup in Florida you must be able to demonstrate that the agreement at issue is invalid for some reason. This article highlights some of the most common reasons for which courts in Florida invalidate prenups, but it is important to note that this list is not exhaustive and only includes some of the most commonly cited reasons. 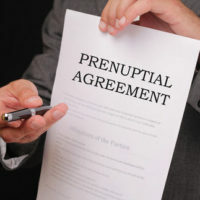 If you are interested in fighting a Florida prenup be sure to consult with a local prenuptial agreement attorney about the best way to fight your particular contract. The Agreement is Fraudulent – A contract can be deemed fraudulent for a variety of reasons, but when it comes to fraudulent prenuptial agreements the most commonly cited reason is “failure to disclose fully”. This happens when one, or both spouses, fail to fully disclose all of his/her assets before the prenup was executed. A Spouse was Coerced into Signing – A prenup may also be invalidated if one spouse was forced to sign the agreement. In fact, some courts will even invalidate a prenup even if a spouse was under an “improper” amount of pressure to sign. There was Insufficient Time for Consideration – When an individual is presented with a prenuptial agreement, he/she must be afforded sufficient time to review the document and to think it over before signing. Although the amount of time required to constitute “sufficient time” is generally debatable, individuals who are asked to sign a prenup right before they walk down the aisle may have a shot at having their prenup invalidated in Florida for insufficient time for consideration. The Contract is Unconscionable – If the agreement is, given the circumstances, unconscionable, a court may find the contract to be invalid. However, it should be noted that in Florida, a prenuptial agreement which contains unconscionable financial provisions for a party will nonetheless be likely upheld if that party signed it with sufficient knowledge of the other party’s financial condition at the time the agreement was signed. Voluntary Amendment or Revocation – In Florida, a prenuptial agreement can be amended or revoked during the couple’s marriage at any time. When this is accomplished via a signed and written amendment or revocation that the spouses voluntarily and properly executed, then the previous agreement (or parts of the previous agreement) is generally no longer valid. If you live in Florida and would like help fighting or enforcing a prenuptial agreement contact attorney David L. Hirschberg today. Here at the Law Offices of David. L. Hirschberg, P.A. our experienced family law firm assists each and every one of our clients with the utmost professionalism and compassion. We understand how emotionally charged family law matters can be and take great pride in helping conclude challenging times in our clients’ lives as quickly and as favorably as possible. Our Boca Raton office can be reached by calling (561) 288-8620.